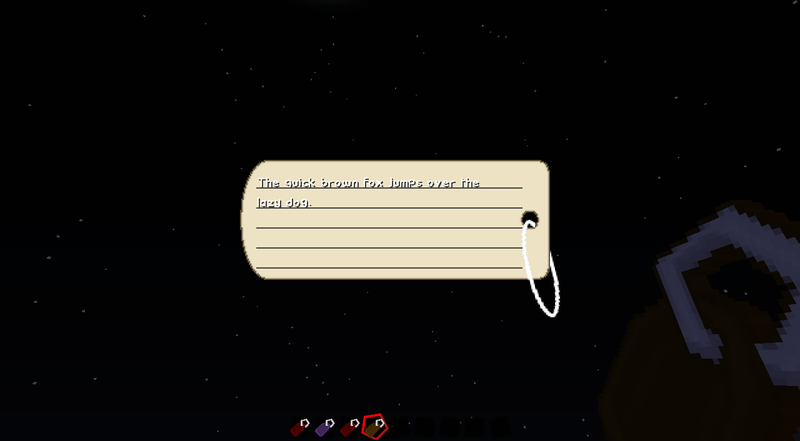 "This little mod adds four simple items to the game: The Lore Tag, the Description Tag, the Warrior Tag and the Butcher Tag. Finally, it adds a recipe to Name Tags. This is the same one Tinkers Construct or DiyoTweaks adds and all inspiration and credit goes to them. It's pointless for that thing to be dungeon loot only ^^"
Update: GUI currently is not the correct resolution, may fix soon. Currently, this patch is only available in the 64x resolution. Sphax - For the original Name Tag texture that I used as a base template.